This was the longest driving day of the trip. We set an early alarm and had breakfast in the hotel. By 9:15 am, we were packed, checked out and on the road. We drove southeast across Southern Germany. The trip took us through a bunch of small towns along the top of Lake Constance. Jack had wanted to have lunch in Litchensutein so he could add another country, but that would have added an hour and a half to two hours to the day. With one stop, we made the drive about 4 1/2 hours. After two one night stops, we will be spending two nights at Villa Ludwig Suite Hotel in Hohenschwangau. We checked in and dumped our stuff in the room. When we checked in, we arranged with the hotel staff to make reservations for the castle tours. We wandered up into the tourist area below the castles for lunch. Sharon's brother Tom suggested this stop; he and his family had stopped here. It is a major tourist attraction. There were people everywhere. Apparently, a lot of people come on day trip tours from Munich. After getting a bit to eat, we wandered back to the room. We then headed to Tegelburg Cable Car. There is a luge at the base of the cable car. All three of us took multiple runs down the luge. Afterwards, Sharon and Jack took the cable car to the top of the mountain, while I had a cold drink... There were a lot of parasails jumping off the top of the cable car and floating down into the valley. Back at the hotel, the three of us spent some time in the spa. The hotel had a great spa with a hot tub, steam room and sauna. We then spent some time on the hotel patio with a cold drink. 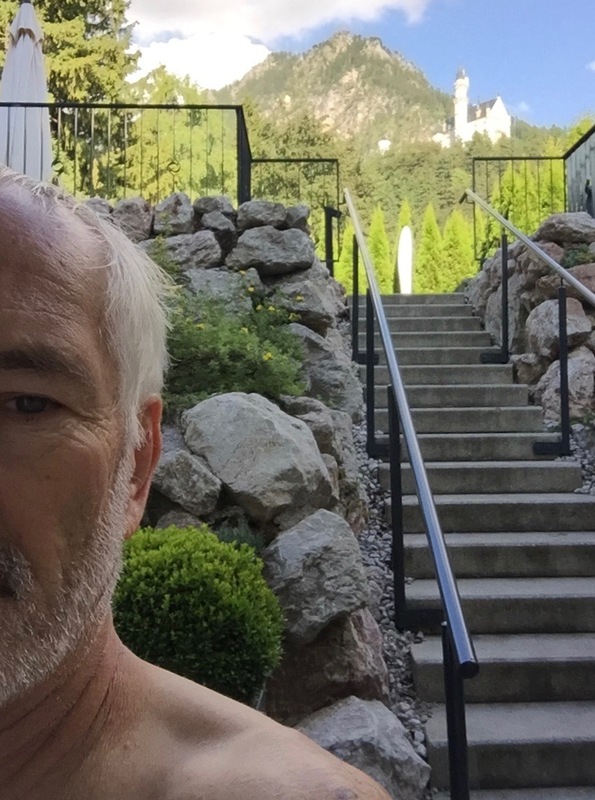 The hotel has a fantastic view of the Neuschwanstein Castle from the patio and the hot tub! Just before we crashed for the night, we got some upsetting news.